In the hot summer months, your car is at a greater risk of overheating, but this common problem can happen in winter as well. 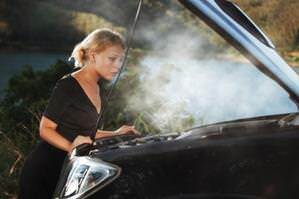 There can be many different causes, but regardless of the reason, there are certain things you should do to attempt to remedy an overheating engine and possibly even save your car. If you see the temperature gauge beginning to rise to a dangerous level, the first thing you should do is turn off the air conditioner, which can put additional strain on the engine. If you need air, drive with the windows down. If turning off the air conditioner doesn’t help, your next option is to turn on the heater and head for the mechanic. The drive won’t be any fun in the summertime, but allowing some heat to move away from the overheating engine and into the car can often provide just enough relief to get you to a repair shop in one piece. If the heater doesn’t help your situation, you need to stop driving. Pull over to the side of the road and immediately shut off the engine. If you want to pop the hood and check the engine, be very careful, as any surfaces you touch could be extremely hot. If you see steam or smoke coming out of an overheating engine, don’t attempt to open the hood. Instead, call a tow truck and wait for help to arrive. If you have a particularly long wait for a tow truck or just want to take care of the issue yourself, wait for the engine to cool down and then pop the hood. Examine the coolant tank, which is located near the radiator. If it appears to be empty, you most likely have a leak. Another way to check is to get below the car and look for dripping fluids. If the tank appears to be full and you don’t have any fluids leaking from beneath, the problem is occurring in a different part of the engine. Either way, taking the car to a professional mechanic is your best bet. It’s always a good idea to carry an extra bottle of coolant in your vehicle. That way, if the problem is a simple leak, you can add more coolant and often remedy an overheating engine for long enough to drive to the mechanic shop. You can also add water instead of coolant, but be extremely careful to not pour cool water into a still-warm radiator. Doing so could cause cracking and leave you with a much more expensive repair bill. If your car ever begins overheating while you’re stuck in traffic, try not to panic. The situation can be very stressful, but if you act carefully, your car will most likely be okay. First, put on the emergency flashers to let other drivers know you’re having trouble. Next, put the car in neutral or park, hold down the brake and rev your engine a few times. This will allow more water and coolant to flow and hopefully cool down your engine. Lastly, as soon as the opportunity presents itself, pull over to the side of the road and assess the situation from there.